The recorded history of Lahore (Punjabi: لہور دی تریخ, Urdu: تاریخ لاہور ‎), the second largest city-district of Pakistan, covers thousands of years. Originally the capital and largest city of the Punjab region, it has since its creation changed hands from Jain, Hindu, Buddhist, Greek, Muslim, Mughal, Afghan, Sikh and the British, thereby becoming the cultural capital and the heart of modern-day Pakistan. An old street-scene in Lahore. A mythological legend, based on oral traditions, states that Lahore was named after Lava, son of the Hindu god Rama, who supposedly founded the city. Lahore Fort has a vacant temple dedicated in honour of Lava. Likewise, the Ravi River that flows through northern Lahore was said to be named in honour of the Hindu goddess Durga. Ptolemy, the celebrated astronomer and geographer, mentions in his Geographia a city called Labokla situated on the route between the Indus river in a region described as extending along the rivers Bidastes or Vitasta (Jhelum), Sandabal or Chandra Bhaga (Chenab), and Adris or Iravati (Ravi). The oldest authentic document about Lahore was written anonymously in 982 and is called Hudud-i-Alam. It was translated into English by Vladimir Fedorovich Minorsky and published in Lahore in 1927. In this document, Lahore is referred to as a small shahr (city) with "impressive temples, large markets and huge orchards." It refers to "two major markets around which dwellings exist," and it also mentions "the mud walls that enclose these two dwellings to make it one." The original document is currently held in the British Museum. Plutarch as well as many other scholars suggest that Jainism was the most ancient and original religion in Punjab. Lahore was the cultural centre of Jainism. A book written by Plutarch, Life of Alexander talks about the encounters between Alexander the Great and digambara Jain saints called gymnosophists. Bhabra or Bhabhra is an ancient merchant community from Punjab region which mainly follows Jainism. It is believed to be connected with the Bhavadar or Bhavada Gachchha to which the Jain Acharya Kalakacharya belonged to. They may have originated from the Bhabra town (32° 13' 30": 73° 13'). Inscriptions suggest that Bhavada Gachchha had survived until the 17th century. There were Jain temples at localities still called Thari Bhabrian and Gali Bhabrian. An 1876 engraving of Rajputs, from the Illustrated London News. The city of Lahore has a Gurjara origin. The earliest princes were said to be traditional Gurjar. Hieun Tsang, the Chinese traveller, who visited the Punjab in 630 AD, speaks of a large city, containing many thousands of families, chiefly Brahmans, situated on the eastern frontier of the kingdom of Cheka, which he says, extended from the Indus to the Beas river. Chinese traveller Faxian, who visited South Asia between 337 and 472 CE, calls Lohana a brave community ruling the northwest territory of South Asia, in his diary. Another Chinese traveler, Kurmang who came in the eleventh century A.D. speaks of a Lohrana kingdom as a mighty power. [dubious – discuss] Historian Burton writes Lohanas were brave people and says they were spread over today's Baluchistan (Pakistan), Afghanistan and eastern fringes of Central Asia. Col. Todd, who delved into history of Rajasthan, describes Lohanas as one of the oldest Kshatriya community. Present view of the Ichhra Bazaar (Market) at night. The market, because of being designed in very old style is very narrow for vehicles to cross and shoppers to walk. There are no architectural remains of the old Hindu city of Lahore, a circumstance which might well be explained by the absence of stone material, and the numerous destructive invasions to which the city has been subjected. But also, in accordance with what all Indian architectural researchers tend to show namely, that the northern Hindus were not, until a comparatively late period, in the habit of building temples, or durable edifices of any kind. Even at Delhi, the seat of Hindu dynasties from upwards of a thousand years before CE to more than a thousand years after CE, and there, where is abundance of stone, no specimens of Hindu architecture exist dating earlier than the tenth or eleventh century. At the period of the first Muslim conquests, Lahore was in possession of a Rajput King Prithviraj Chauhan, of the family of Ajmer. Whether owing to change of dynasty, or to Lahore's exposed position on the high road from Afghanistan to India, it was subsequently deserted and the seat of the government was removed to Sialkot or its vicinity, where it remained until the period of the conquests of Sultan Mahmud Ghaznavi in the beginning of the eleventh century; that the conqueror re-occupied the deserted city, and established a garrison in a fort, which was built possibly, like the Old Fort at Delhi, on the ruin of the old Rajput stronghold. In 682 AD, according to Ferishta, the Afghans of Peshawar, who had, even at that early period, embraced Islam, wrested certain possessions from the Hindu prince. A war ensued, and in the space seventy battles were fought with varied success, until the Afghans, having formed an alliance with the Ghakkars, a wild tribe inhabiting the Salt Range of Punjab, compelled the Raja to cede a portion of his territory. The next mention of Lahore is in the Rajputana chronicles, where the Bussas of Lahore, a Rajput tribe, are mentioned as rallying to the defence of Chittore, when besieged by Muslim forces in the beginning of the ninth century. Image of Sultan Mahmud Ghaznavi in his court where noblemen and noblewomen convened. The mausoleum of Sultan Qutub ud Din Aibak in Anarkali, Lahore, Pakistan. At length, in 975 AD, Sultan Sabuktigin, Governor of Khorassan and father of the celebrated Sultan Mahmud Ghaznavi advanced beyond the Indus. He was met by Raja Jayapala, the Raja of Lahore whose dominion is said to have extended from Sirhind to Laghman and from Kashmir to Multan. By the advice of the Bhati Rajput tribe, the Raja Jayapala formed an alliance with the Afghans, and, with their aid, was enabled to withstand the first invasion. However, Sabuktigin later repeated his conquest on his succession to the throne of Ghazni. A battle ensued in the vicinity of Lamghan ending with the defeat of the Raja and overtures being made for peace. His terms were accepted and persons were sent, on the part of Sabuktigin, to take the balance of the stipulated ransom. On reaching Lahore, Jayapala proved faithless and imprisoned those commissioned to receive the treasure. On learning intelligence of his perfidy, Sabuktigin, in the words of the Ferishta, "like a foaming torrent, hastened towards Hindustan". Another battles ensued, in which Jaipal was again vanquished, and he retreated, leaving the territory to the west of the Nilab or Indus in the hands of the invader. The invader did not retain the conquests that he had made for in 1008 AD, a confederation headed by Anandapala, the son of Raja Jayapala, again met the advancing army, now commanded by Mahmud, son and successor of Sabaktagin, in the vicinity of Peshawar. Lahore was allowed to remain intact for thirteen years longer. Anandapala was succeeded by Nardjanpal, while Mahmud pushed his conquests into Hindustan. But in 1022 AD, he suddenly marched down from Kashmir, seized Lahore without opposition, and gave it over to be plundered. Nardjanpal fled helpless to Ajmer, and the Hindu principality of Lahore was extinguished forever. A final effort was made by the Hindus in the reign of Modud, 1045 AD, to recover their lost sovereignty, but after a fruitless siege of six months, they retired without success. 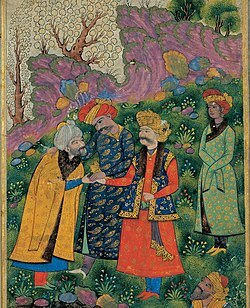 Sultan Mahmud Ghaznavi is to the right, shaking the hand of the Shaikh, with Ayaz standing behind him. The figure to his right is Shah Abbas I, who reigned about 600 years later. Few references to Lahore exist for times before its capture by Sultan Mahmud Ghaznavi in the eleventh century. In 1021, Mahmud appointed Malik Ayaz to the throne and made Lahore the capital of the Ghaznavid Empire. The Sultan Mahmud Ghaznavi took Lahore after a long siege and battle in which the city was torched and depopulated. As the first Muslim ruler of Lahore, Ayaz rebuilt and repopulated the city. The present Lahore Fort stands in the same location. Under his rule, the city became a cultural and academic center, renowned for poetry. The tomb of Malik Ayaz can still be seen in the Rang Mahal commercial area of town. After the fall of the Ghaznavid Empire, Lahore was ruled by various Muslim dynasties known as the Delhi Sultanate, including the Khaljis, Tughlaqs, Sayyid, Lodhis and Suris. When Sultan Qutb-ud-din Aybak was crowned here in 1206, he became the first Muslim Sultan of South Asia. It was not until 1524 that Lahore became part of the Mughal Empire. The Mongols invaded and conquered the Khwarazmian dynasty, the King Jalal ad-Din Mingburnu retreated to modern Khyber Pakhtunkhwa but was defeated in Battle of Indus. The Mongol army advanced and in 1241, the ancient city of Lahore was invaded by 30,000-man cavalry. The Mongols defeated the Lahore governor Malik Ikhtyaruddin Qaraqash, massacred the entire population and the city was leveled to the ground. There are no buildings or monuments in Lahore that predates the Mongol destruction. In 1266, Sultan Balban reconquered Lahore from the Mongols but in 1296 to 1305 the barbaric Mongols again overran northern Punjab. In 1298, 200,000 men Mongol army conquered Punjab and committed atrocities then marched towards Delhi but was defeated by Malik Kafur general of Sultan Alauddin Khalji ruler of the Delhi Sultanate. The last Lodi ruler, Sultan Ibrahim Lodi was greatly disliked by his court and subjects. Upon the death of his father Sultan Sikandar Lodi, he quashed a brief rebellion led by some of his nobles who wanted his younger brother Jalal Khan to be the Sultan. After seizing the throne by having Jalal Khan murdered, he never really did succeed in pacifying his nobles. Subsequently, Daulat Khan, the governor of Punjab and Alam Khan, his uncle, sent an invitation to Babur, the ruler of Kabul to invade Delhi. The first Battle of Panipat (April 1526) was fought between the forces of Babur and the Delhi Sultanate. Ibrahim Lodi was killed on the battlefield. By way of superior generalship, vast experience in warfare, effective strategy, and appropriate use of artillery, Babur won the First battle of Panipat and subsequently occupied Agra and Delhi. Entrance of the Badshahi Mosque or Emperor's Mosque built by the Mughal Emperor Aurangzeb. The Alamgiri Gate is the main entrance to the Lahore Fort built during the reign of Aurangzeb. Lahore reached a peak of architectural glory during the rule of the Mughals, whose buildings and gardens survived the hazards of time. Lahore's reputation for beauty fascinated the English poet John Milton, who wrote "Agra and Lahore, the Seat of Great Mughal" in 1670. From 1524 to 1752, Lahore was part of the Mughal Empire. Lahore touched the zenith of its glory during the Mughal rule from 1524 to 1752. The Mughals, who were famous as builders, gave Lahore some of its finest architectural monuments, many of which are extant today. Emperor Aurangzeb seated on a golden throne holding a hawk in the Durbar. From 1524 to 1752, Lahore was part of the Mughal Empire. Lahore grew under emperor Babur; from 1584 to 1598, under the emperors Akbar the Great and Jahangir, the city served as the empire's capital. Lahore reached the peak of its architectural glory during the rule of the Mughals, many of whose buildings and gardens have survived the ravages of time. Lahore's reputation for beauty fascinated the English poet John Milton, who wrote "Agra and Lahore, the Seat of the Great Mughal" in 1670. During this time, the massive Lahore Fort was built. A few buildings within the fort were added by Akbar's son, Mughal emperor Jahangir, who is buried in the city. Jahangir's son, Shahjahan Burki, was born in Lahore. He, like his father, extended the Lahore Fort and built many other structures in the city, including the Shalimar Gardens. The last of the great Mughals, Aurangzeb, who ruled from 1658 to 1707, built the city's most famous monuments, the Badshahi Masjid and the Alamgiri Gate next to the Lahore Fort. During the 17th century, as Mughal power dwindled, Lahore was often invaded, and government authority was lacking. The great Punjabi poet Baba Waris Shah said of the situation, "khada peeta wahy da, baqi Ahmad Shahy da" — "we have nothing with us except what we eat and wear, all other things are for Ahmad Shah". Ahmad Shah Durrani captured remnants of the Mughal Empire and had consolidated control over the Punjab and Kashmir regions by 1761. The Delhi Sultanate and later Mughal Empire ruled the region. The Lahore region became predominantly Muslim. Due to missionary Sufi saints whose dargahs dot the landscape of Punjab region, and to the efforts of Mughal emperors, whose policies and forced religious conversions discouraged the growth of other religions. The 1740s were years of chaos, and the city had nine different governors between 1745 and 1756. Shortly after defeating the Afghans in the Battle of Delhi, the Marathas entered Lahore in 1758. In March 1758, about 50,000 soldiers of the Maratha Empire laid siege to Sirhind, with a usual alliance with Khalsa and Mughal Commander Khan Adina Beig. At that time, the Afghan general Jahan Khan, along with Abdali's son Taimur Shah, had 25,000 troops with him. On 20 April 1758, the Marathas entered Lahore. Raghunathrao, the Maratha peshwa who conquered Lahore in 1758. In 1759, the Maratha and its allied forces defeated the Durrani Empire in the Battle of Lahore. The Maratha Empire had made large successes, capturing Delhi, Punjab, Kashmir, Multan, Peshawar and Attock. Shortly after that, in 1761 A.D, As Marathas were defeated in Panipat and Ahmed Shah went back to Afghanistan a chaos resulted. Lack of local government and no head or ruler in the Punjab allowed Sikh Misls to gain effective control of their respective areas. From 1764 to 1799, Bhangis controlled the Lahore province. The latter part of the Bhangi rule is considered as very oppressive and unjust. In the end of 1798, The High Gentry of Lahore, comprising all three religions, made a combined and effective petition before, Ranjit Singh, the chief of Sukerchakia Misl to invade and take control of the Lahore province which he successfully did with the help of his mother-in-law, Sada Kaur's Kanhaiya Misl. During the 18th century, as Mughal power dwindled, Lahore was often invaded by Afghan armies and became a province of the Afghan Empire, governed by provincial rulers with their own court. The Sikhs warring band invaded after the decline of the Mughal Empire in Punjab and created of a collection of autonomous Misls, which were governed by Misldars, mainly in the Punjab region. Early in Aurangzeb's reign, various insurgent groups of Sikhs engaged Mughal troops in increasingly bloody battles. In 1670, the ninth Sikh Guru, Guru Tegh Bahadur encamped in Delhi, receiving large numbers of followers, was said to have attracted the wrath of Emperor Aurangzeb. After the decline of the Mughal Empire, the Sikh invaded and occupied Lahore District. The execution of Guru Tegh Bahadur infuriated the Sikhs. In response, his son and successor, the tenth Guru of Sikhism Guru Gobind Singh further militarized his followers. Twelve Sikh misls joined into one to form a new empire and sovereign Sikh State ruled by Maharaja Ranjit Singh. Ranjit Singh was crowned on 12 April 1801 at Lahore. The 1740s were years of chaos, and the city had nine different governors between 1745 and 1756. Invasions and chaos in local government allowed bands of warring Sikhs to occupy some areas. In 1799, all Sikh Misls (warring bands) joined into one to form a sovereign Sikh state ruled by Maharaja Ranjit Singh from the royal capital, Lahore. During the 1740s, frequent invasions by Afghans led by Ahmad Shah Abdali and has created chaos in local government had made life very uncomfortable for the citizens of Lahore. Bhangi Misl was the first Sikh band to invade and plunder the Mughal Lahore. Later Ranjit Singh was able to make gains in this chaos. He defeated the grandson of Abdali, Zaman Shah in a battle between Lahore and Amritsar. Out of the chaos of Afghan and Sikh conflicts Ranjit Singh who was able to unify the Sikh factions and capture Lahore where he was crowned Emperor. Many visitors to Lahore during this era noted that much of the city was in disrepair and many of its Muslim monuments and Mosques were pillaged and desecrated by the Sikhs. The land, palaces and houses of Muslim nobility were confiscated by the Sikhs Sardars. The Samadhi of Emperor Ranjit Singh in Lahore, Pakistan. While much of Lahore's Mughal era fabric lay in ruins by the end of eighteenth century due to the destruction and plunder by the Sikh Bhangi Misl. Ranjit Singh's death on 27 June 1839 ultimately ended his reign, while the Sikh rule continued until the British gained control of the empire in 1849. On 7 July 1799, the Sikh militia of the Sukerchakia chief, Ranjit Singh, occupied Lahore. Ranjit Singh used the Hazuri Bagh, the enclosed garden next to the Mosque as his official royal court of audience. In 1762 A.D., the Bhangi Sikh Sardar army conquered Lahore and occupied the Shaheed Ganj Mosque, together with the courtyard. Shaheed Ganj area being named after Sikhs who had been scalped and killed there during the Mughal empire. The Muslims were prohibited from entering and praying at the Mosque. The Sikhs built a Gurdwara, Sikh temple, in the courtyard and used the Shaheed Ganj Mosque building to house Sikh priests.The Sikhs built a Gurdwara, Sikh temple, in the courtyard and used the mosque building to house Sikh priests. Syed Ahmad Barelvi a Muslim nationalist received desperate pleas of help from the persecuted Muslims of the Punjab region. The Muslims were prohibited to call Azan and lands belonging to the waqf endowments which provided financial support to Muslim institutions were confiscated by the Sikhs. Syed Ahmad Barelvi in 1821 with many supporters and spent two years organizing popular and material support for his Punjab campaign. He carefully developed a network of people through the length and breadth of India to collect funds and encourage volunteers, traveling widely throughout India attracting a following among pious Muslims. In December 1826 Sayyid Ahmad and his followers clashed with Sikh troops at Okara but with no decisive result. In a major battle near the town of Balakot in 1831, Sayyid Ahmad and Shah Ismail Shaheed with volunteer Muslims were defeated and martyred by the professional Sikh Army. In 1841, during the Sikh civil war, Ranjit Singh's son, Sher Singh, used the Badshahi Mosque's large minarets for placement of zamburahs or light guns, which were placed atop the minarets of Badshahi Mosque to bombard the supporters of the Sikh Maharani Chand Kaur taking refuge in the besieged Lahore Fort, inflicting great damage to the Fort itself. In one of these bombardments, the Fort's Diwan-e-Aam (Hall of Public Audience) was destroyed (it was subsequently rebuilt by the British but never regained its original architectural splendour). During this time, Henri De la Rouche, a French cavalry officer employed in the army of Sher Singh, used a tunnel connecting the Badshahi Mosque to the Lahore Fort to temporarily store gunpowder. Maharajah Ranjit Singh made Lahore his capital and was able to expand the kingdom to the Khyber Pass and also included Jammu and Kashmir, while keeping the British from expanding across the River Sutlej for more than 40 years. After his death in 1839 the internecine fighting between the Sikhs and several rapid forfeitures of territory by his sons, along with the intrigues of the Dogras and two Anglo-Sikh wars, eventually led to British control of the Lahore Darbar ten years later. Capitalizing on the disarray surrounding the succession struggles after Ranjit Singh's death and only partially diminished by a war fought against the Sikhs on their eastern frontier, the British rode into Lahore in February 1846 and garrisoned their troops in the citadel. Two unstable years later, they were drawn into a second war with the Sikhs at the southern city of Multan when that city's governor, Mul Raj, encouraged his troops to rebel. After a series of closely fought battles, the Sikh army was finally defeated in the Battle of Gujrat, sixty miles north of Lahore. In March 1848, following the British victory, Dalip Singh, Ranjit Singh's teenage son and heir to the throne, was formally deposed in Lahore. The remaining Sikh regiments in the city were abruptly decommissioned and camped outside the city demanding severance pay. Within a year, the Punjab was formally annexed to the British Empire and military sappers had begun leveling Lahore's city wall. For the British, Punjab was a frontier province, because Lahore had boundaries with Afghanistan. Therefore, the Punjabis, unlike the Bengalis and the Sindhis, were not allowed to use their mother tongue as an official language. The British first introduced Urdu as an official language in Punjab, including Lahore, allegedly due to a fear of Punjabi nationalism. During the rule of British colonial government, the Punjabi Muslims started reclaiming and rebuilding of the Muslim monuments occupied, damaged and destroyed by the Sikhs during their heavy handed rule in the Punjab region. Under British rule (1849–1947), colonial architecture in Lahore combined Mughal, Gothic and Victorian styles. The General Post Office (GPO) and YMCA buildings in Lahore commemorated the golden jubilee of Queen Victoria, an event marked by the construction of clock towers and monuments all over India. Other important British buildings included the High Court, the Government College University, the museums, the National College of Arts, Montgomery Hall, Tollinton Market, the University of the Punjab (Old Campus) and the Provincial Assembly. Under British rule, Sir Ganga Ram (sometimes referred to as the father of modern Lahore) designed and built the General Post Office, Lahore Museum, Aitchison College, Mayo School of Arts (now the NCA), Ganga Ram Hospital, Lady Mclagan Girls High School, the chemistry department of the Government College University, the Albert Victor wing of Mayo Hospital, Sir Ganga Ram High School (now Lahore College for Women) the Hailey College of Commerce, Ravi Road House for the Disabled, the Ganga Ram Trust Building on Shahrah-e-Quaid-e-Azam, and the Lady Maynard Industrial School. He also constructed Model Town, a suburb that has recently developed into a cultural center for Lahore's growing socioeconomic elite. Viceroy Lord Mountbatten of Burma with a countdown calendar to the Transfer of Power in the background. 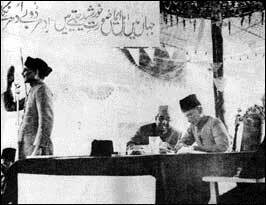 Chaudhry Khaliquzzaman seconding the Lahore Resolution with Muhammad Ali Jinnah presiding the Lahore session. Minar-e-Pakistan, where the Pakistan Resolution was passed. Lahore enjoys a special position in the history of Pakistan Movement and Indian Independence Movement. The 1929 Congress session was held at Lahore. In this Congress, a resolution of "complete independence" was moved by Pandit Nehru and passed unanimously at midnight on 31 December 1929. On this occasion, the contemporary tricolor of India (with a chakra at its centre) was hoisted as a national flag, and thousands of people saluted it. The predominantly Muslim population supported Muslim League and Pakistan Movement. After the independence of Pakistan in 1947, the minority Hindus and Sikhs migrated to India while the Muslim refugees from India settled in the Lahore District. Lahore is regarded as the heart of Pakistan and is now the capital of the Punjab province in the state of Pakistan. Almost immediately after the independence, large scale riots broke out among Muslims, Sikhs and Hindus, causing many deaths as well as damage to historic monuments—including the Lahore Fort, Badshahi Mosque and other colonial buildings. With United Nations assistance, the government was able to rebuild Lahore, and most scars of the communal violence of independence were erased. Less than 20 years later, however, Lahore once again became a battleground in the War of 1965. The battlefield and trenches can still be observed today close to the Wagah border area. After independence, Lahore was eclipsed by Karachi, which quickly became the biggest and most industrialized city. It was not until the administration of Mian brothers, and the 1990s riots in Karachi that Lahore once again gained its significance as an economic and cultural powerhouse through government reforms. The second Islamic Summit Conference was held in the city. In 1996, the International Cricket Council Cricket World Cup final match was held at the Gaddafi Stadium in Lahore. The Walled City of Lahore known locally as the "Un-droone Shehr" (Inner City) is the oldest and most historic part of Lahore. The Punjab government embarked on a major project in 2009 to restore the Royal Trail (Shahi Guzar Gah) from Akbari Gate to the Lahore Fort with the help of the World Bank under the Sustainable Development of the Walled City of Lahore (SDWCL) project. The project aims at the Walled City development, at exploring and highlighting economic potential of the Walled City as a cultural heritage, exploring and highlighting the benefits of the SWDCL project for the residents, and at soliciting suggestions regarding maintenance of development and conservation of the Walled City. The present day Lahore is a three-in-one city. That is why, when one visits Lahore; he finds three different cities – each distinguished from other in one way or other. The old city – existed for at least a thousand years – developed in and around circular road. Similarly, the British built Lahore covers the area from Mayo Hospital to the Canal Bank on the east. Unquestionably, third Lahore which includes various posh localities such as Gulberg, Bahria Town Joher town, Defence Housing Authority along with several others developed after the independence. Samnabad is a major residential area and administrative subdivision of Lahore, Pakistan. It is the one of Oldest Posh areas of Lahore and located in the center of City. ^ Amin, Mohamed; Willets, Duncan; Farrow, Brendan (1988). Lahore. Lahore, Punjab, Pakistan: Ferozsons, Ltd. p. 20. ISBN 969-0-00694-0. ^ unknown (1793). The British critic, Volumes 1-2. p. 152. ^ Muḥammad Qāsim Hindū Shāh Astarābādī Firishtah (1829). History of the rise of the Mahomedan power in India: till the year A.D. 1612. p. 9. ^ "Lahore Profile: History". City Government Lahore. City District Government Lahore. Archived from the original on 29 December 2008. Retrieved 18 August 2013. ^ Tamara, Sonn (2011). Islam: A Brief History. John Wiley & Sons. ^ Jacques, Tony. Dictionary of Battles and Sieges Archived 2015-06-26 at the Wayback Machine. Greenwood Press. p. 562. ISBN 978-0-313-33536-5. ^ Marathas and the English Company 1707–1818 by Sanderson Beck". san.beck.org. Retrieved 2015-04-10. ^ Encyclopædia Britannica Eleventh Edition, (Edition: Volume V22, Date: 1910–1911), Page 892. ^ Maybin, Janet. Language and literacy in social practice. Open University. p. 102. ^ Coulmas, Florian. Writing systems. p. 232. ^ Gill, Anjum. "Father of modern Lahore remembered on anniversary." Daily Times (Pakistan). July 12, 2004. ^ Story of Pakistan – Lahore Resolution 1940, Jin Technologies. Retrieved on September 19, 2007. Wikimedia Commons has media related to History of Lahore. This page was last edited on 14 March 2019, at 11:36 (UTC).